Specifically formulated for use in all types of low flow residential treatment systems, Blue Crystal tablets safely disinfect wastewater without damage to lawns, shrubbery or streams. Meets all state and local requirements. A 1.9 pound pail holds 6 tablets and can be shipped without a hazardous material handling fee. Specifically formulated for use in all types of low flow residential treatment systems, Blue Crystal tablets safely disinfect wastewater without damage to lawns, shrubbery or streams. Meets all state and local requirements. The 8 pack carton holds eight 1.9 pound pails and can be shipped without a hazardous material handling fee. Specially formulated for use in all types of low flow residential treatment systems, Blue Crystal tablets safely disinfect wastewater without damage to lawns, shrubbery or streams. Meets all state and local requirements. A 10 pound pail is approximately a four month supply of tablets. Price includes $35.00 UPS hazardous material handling fee. Due to U.S. Department of Transportation regulations, this product must be shipped via UPS ground service. Blue Crystal tablets are also available in 100 pound drums that must be shipped via commercial carrier. Contact Norweco for ordering and shipping information. Four 10 pound pails for one low shipping fee. 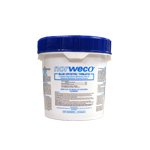 Meets all state and local requirements for residential wastewater disinfection. Each 10 pound pail is approximately a four month supply.